As always happens, there comes the spring day when we are finally close enough to the Alps to actually see rather than just remember them. The pollution and stormy weather always make it a guessing game and for days we strain trying to separate them from the clouds in the distance. This year it was the morning we left the small city of Chivasso in northwestern Italy that we spotted them though they had been invisible the day before. Overnight showers had cleared the air a bit and we were just enough closer that within an hour of leaving town, Bill saw the first of the mountains looming out of the flat land, mountains with snow on them. Their appearance in the partially obscuring haze was in sharp contrast to the vivid memories that they provoked. Snapshots in our minds of clear blue skies and grand panoramas at high passes were what we saw, not the distant, almost silhouettes of uplifted land. Our minds were not to be distracted by the fuzzy, present reality as in a few days when we were higher and closer, our old memories would match what was then before us. Though we had been in Chivasso before, this year we were heading north from it into one of Italy's several autonomous regions--regions with even more convoluted histories than the rest of the country and that have secured special privileges. Usually there is a distinct and strong cultural difference in these regions that is punctuated by favoring a different language. This year we were visiting "Val d'Aosta" ("oh-stah") for the first time, a region with French leanings. It was Mont Blanc to the French, or Monte Bianco to the Italians, that Map Man had in his sights at the end of Val d'Aosta. His yearning to walk upon the highest mountain in Europe was charting our course. 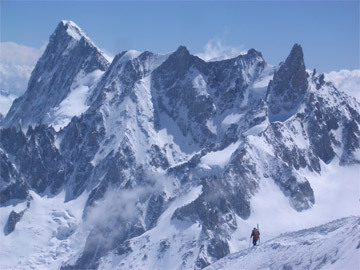 Decidedly French sounding "Courmayeur" near both the French and Swiss borders with Italy would be our launching point for visiting the fabled mountain. Ah, but we must be patient and take in the sights along the way to Courmayeur ("core-my-yer") and an unexpected sight was the big bike race, the Giro d'Italia. I believe the "Giro" is second in importance only to the Tour d' France and it goes on for weeks with multiple teams participating as in the Tour. We hadn't seen it before and only realized the day before that our route would be overlapping with theirs. Overlapping with a big bike race has its risks and rewards. The obvious reward is seeing the big names in the sport fly by at speeds we can only imagine; the risks are delays and the possibility of being shut-out of lodging. We scrambled to get more details about their route and were relieved to discover that not only was their starting point for the day miles from ours, more importantly, so was their destination. 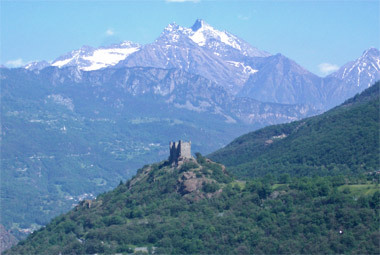 The Giro & the Bard Castle which was rebuilt in the 19th century. Amazingly, the extremely helpful tourist info office just across the political line into Val d'Aosta printed out the Giro's schedule for the next 5 days, including expected times in about 15 minute intervals along their route. Armed with those details, we picked our spot to stop for lunch to wait for them, knowing that the road would be closed to all traffic as they approached. We remembered the 3 cool backpacks tossed to us by the promotional caravan that preceded the Tour d' Suisse in 2005, so we carefully positioned ourselves for the Giro folks to effortlessly grace us with some equally useful goodies. The spot we selected also needed to line us up for a good view of the riders and provide good lighting for photos. Then we waited. But the Giro was all business in the promotions department: the dozens of souvenir vans that preceded the cyclists were selling souvenirs and we saw nothing dished out for free. Disappointed. we settled for photos as our race souvenir. Later we learned that the Giro organizers were indeed shrewd business people. They propose a route and sell the privilege of being a starting or stopping point town to the highest bidders. And they even end a race day in one town and start the next morning in another to double the number of bidders. But we don't know who financed the 600,000€ road that was built specifically for the Giro and was to only be used once. Unfortunately this specially surfaced mountain road was still under snow at the time of this year's Giro and wasn't even used. The excitement of the Giro lingered for more than a week as we continued to ride much of the same route. For days we spotted the pink flags and pink shirts on the road, as the pink jersey is the coveted equivalent of the yellow jersey in the Tour d' France. And in the evenings if we both had a TV and got in early enough, we would catch a bit of the continuous live coverage of the race. We were still encountering cheers painted on the pavement and roadside banners for the race a month later on what had been their course. In addition to covering some of the same territory this year, their long race also was over part of our 2005 route. As we did last year, they went over Simplon Pass, though they rode from Brig, Switzerland (near Zermatt) to Stresa, Italy and we had ridden it in the opposite direction. Where the police held the traffic for them on the high pass, we had had the benefit of a 5 hour construction delay of traffic to shield us from the worst of the international truck route. We were however very disappointed to have checked into our hotel too late to see the continuous footage of them going up and over Simplon Pass as we hoped the race coverage would allow us to revisit the pass's stunning panoramas we had so enjoyed. The well-marked via Francigena in the autonomous region. We soon learned that the Giro wasn't the only throng with which we shared a route through these mountains, as in Val d'Aosta we were once again on the "via Francigena" pilgrims route. We first knowingly crossed the Francigena in Tuscany at the Monteriggioni Castle--the castle that was funded and built by the people of Siena in 1213. There too the path was the well -worn pilgrims route between France and Rome, in addition to being used by the Florentines to attack Siena. One of the treats in the autonomous regions in Italy is that they tend to be a bit more affluent and lavish more services on visitors and residents alike. 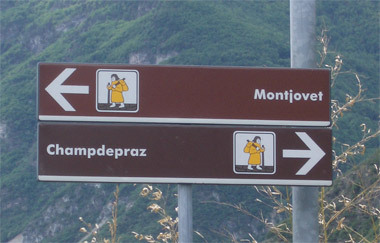 It was their attractive roadside signs in 4 languages that gave us the low-down on the Francigena in the area. Along with the historical signs, there were other tourist-pleasers like special new walkways attached to riverside roadways to give pedestrians protection from the traffic and graceful new bridges just for bikes and pedestrians. In other places in Italy the tourist info offices were closing as cost-cutting measures, in Val d'Asota they were giving out DVD's with walking and bike route information. The Francigena had become an interest to us only because we kept crossing it and it put us on the trail of other intriguing bits of history. As often is the case with roads, the people making it famous weren't the first to use it. At least parts of their route were trod in the 3rd millennium bce by early inhabitants of the recently glacier-free lands. The Etruscans and later the Romans had roads along the same course. And there was a vivid reminder of the Romans presence in this area, as the wheel-rutted stone road that was a segment of the 50,000 miles of roads built by the Romans was still evident outside the village of Donnas and on the way to Bard castle. It was in the Middle Ages that the Francigena flourished with the faithful trekking from Gaul (France) to Rome or the Holy Land. And at the same time, the route was also used by merchants as it linked the lands north of the Alps with the commercial centers of the Italian Po Valley and the Mediterranean. Wagon ruts in the Roman road still lead into Donnas. Like the Santiago de Compestela pilgrimage route we crisscrossed in Spain, the Francigena had several branches. The 3 main starting points, including 1 in Flanders, eventually converged in the Rhone Valley. Then it went up the Valley of Entremont to cross the Alps at St Bernard Pass (which the Giro d'Italia crossed and we didn't) and then south through the Aosta Valley where we again bumped into it. It proceeded down the Artanavaz River and along the Dora Baltea River, which we paralleled for several days. As in Tuscany, our time on the Francigena was limited. We weren't so interested that we wanted to hike on the trails to retrace more of their steps. And the pilgrims preferred route was over the now decidedly un-bike-friendly St Bernard Pass, which we were veering off from to see Monte Blanc. Our electronic version of an encyclopedia did answer one lingering question as we diverged from the pilgrims path, which was that "Yes", there is a connection between St. Bernard dogs and the pass of the same name. Bernard, who later was sainted, developed a hospice at the top of the pass to rescue straying pilgrims and the big dogs were bred to aid in their rescue. Interestingly to us as Roman-philes, the line of dogs used are thought to have been brought to the region from Asia by the Romans. Wanting to understand more about national treasures like the Giro and local historical remnants like the Roman and pilgrim routes nudged us resume our language studies. After our break from being in French speaking Corsica for 3 weeks, we somehow got hooked into learning more Italian by sorting out the names of common animals. "Cat" and "dog" had come up long ago on revealing signs with renditions like the "Black Cat Cafe" and "Beware of the Dog", but now it was time to learn the names of the lunchtime guests, like lizards, ants, and bees. As in the past, our vocabulary lessons were driven by our surroundings. Along the coast, gulls were in need of their Italian counterparts. But in Cinque Terre the names of animals and birds quickly took a backseat to learning the words to help in more urgent matters when we were first on a road that didn't connect with another as shown on the map and then we encountered a road closure. Off the slopes and out of the road hassles, our attention turned back to the large birds, the ones we could actually see, like herons. Eagles and storks showed up on retail signs, so we learned them too. As we moved into the flatter lands of the Po Valley, the Italian word for frog became relevant, as it did for egret. We weren't satisfied with the name we were told for egrets, which translated as "white dove", so we continued to refer to them as the "white birds of the rice fields" until a month later when we found their proper name in a bird book. Then it would be "flies" and "mosquitoes" that become relevant, as would the name for the recently re-introduced brown bears that were featured in tourist literature. And our list of barnyard animals grew and grew. None of these particular words really mattered, but talking about the animals, birds, the changing sky and the wet or dry rice fields was a way to use our short list of verbs and to drill ourselves with difficult pronunciation. As we developed our small zoo of words, I was shocked to discover that I had missed an easy lesson in the baby food aisles in the grocery stores. There the boxes encasing the little jars had charming drawings of the expected animals, like cows, chickens and turkeys plus the unexpected, like horses, trout, and ostriches. I finally had to take Bill on a quick tour of the packages because he just couldn't believe what the Italians were feeding their kids. One of many deafening torrents of water. Biking in northwestern Italy is always a delight because the sights and the terrain changes so rapidly, as our vocabulary lessons also reflected. If you ride at a snappier pace than we do, in a week's time you could be completing a part or full day of walking the steep slopes of the seaside villages of Cinque Terre, then be cruising through very cosmopolitan Genoa or evading its traffic by scooting along in the hills just north of it; a day or 2 later you are in the broad expanses of the Po Valley with its hallmark pollution and rich agricultural lands; and then bam, you're in the Alps. The 1000' high, steep slopes of Mediterranean Cinque Terre were impressive but the Alps dazzle by shooting straight up thousands of feet and by being capped with snow at the highest levels. At the higher elevations, the broad river valley floors narrow until flatland is at a premium and the clear air and the prosperity of the autonomous region grabs our attention. The changing presence of water is also a marker for the changing terrain. Of course, the calm, blue waters of the Mediterranean disappear as you head inland and are replaced by slow moving rivers and extensive irrigation canals of the Po valley. 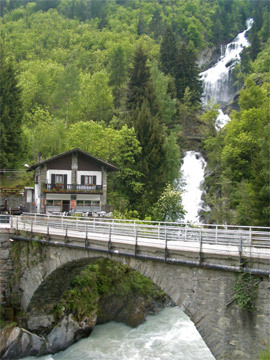 And farther inland, the sights and sounds of rushing water become a distinctive part of our Alps experience. The rush of water was very intense in the Val d'Aosta. One riding day it seemed that we passed a torrent of hillside water every half mile or so. Some courses were no wider than a narrow foot path, others the width of a 2 or 4 lane road, but all were lined with carefully placed stone to keep the gush of water from ripping the hillsides apart. At times, the noise from the river was so loud that we couldn't talk as we biked along it on the main road and even the smallest courses were often heard before we actually saw them. The steepness of the slopes added urgency the discharge of water. Snow was still coming down with the passing storms just below the 9000' level in mid-May, but there must have been a lot of snow melt below that level for all the run-off we saw. The water was usually a milky, pale jade color like it was clouded with morainal grit and not tinged brown like waters that have flooded farm land. The chill in the air as we drew closer to the water's edge reinforced that this was snow melt and not some effluent from a lazy meadow stream. As we rode north and then west up the Aosta Valley for several days, we admired the broad fields occupying the very flat land made fertile by a once mightier Dora Baltea River and we stopped to study the technology used in the occasional, small hillside rock quarries. And for days we were hardly out of sight of one of the 100 old towers or castles on some nearby hilltop. Some dated back to the 11th century, others were as recent at the 19th century. Some of the watch towers looked like little more than a church clock tower, whereas the largest of the castles cascaded commandingly down the slopes. It was easy to imagine the control over the valley that they strove to exert, perhaps some being charged with collecting tolls, and they triggered images of life in a more uncertain time. This and other Medieval towers still watch over the valley. As the elevation of the valley floor got higher, the steep, tree covered slopes more often became rocky faces near their tops, sometimes with snow capping them. The slowly narrowing valley had seduced us as one day it was as though we had been lulled into a lair by an ancient monster in the mountains--suddenly it seemed that jaws were closing in on us from the sides--the broad valley floor was disappearing and the steep slopes were getting too close together. We had miles to go....there was suppose to be more valley....yet it was going away. We no longer scanned grand panoramas, now we could only look up in hopes of seeing a way out. Just how suddenly it became steep was echoed in the other transportation modes. As Bill pointed out, in the valley we rode parallel to the freeway, the train tracks, and the river. When the terrain convulsed and swallowed the broad valley floor, the freeway and railroad disappeared into tunnels. Towards the end of the valley, the fast traffic was spending more time in dark tunnels than in the daylight and scenery we were enjoying. Now and then they would peek out to cross the river or for some engineering efficiency. In this more forbidding terrain, the castles and towers disappeared too, though we don't really know why. In earlier times the Romans sometimes gave up on subduing the mountain people and settled for containing them on their slopes--perhaps that attitude was carried forward into Medieval times. And lower-elevation valley floor life had given way to the sensibility of the mountains and hinted at the reasons behind the autonomous status of this region. 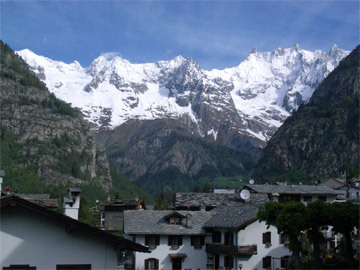 As we continued deeper into Val d'Aosta, the mountain's grip on the land eased and another, higher, broad valley appeared. 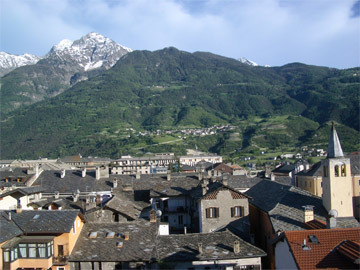 The teeming city of Aosta was the hub of this valley and still reflected its ancient outpost heritage along with that as the modern headquarters for the smallest and least populated region in Italy . We'd biked through farmland and villages and admired the appearance of cows with 6" wide leather collars with their almost bucket-sized bells around their necks on the way there and then suddenly we were in the urban sprawl of the city. Aosta and its setting as seen from our hotel window. This small city of Aosta was started from scratch by the Romans. They picked the spot for its strategic attributes and intentionally founded it to control the already established access routes into France and Switzerland, including the Great and Little St. Bernard Passes. An added bonus of the site for the Romans were the rich reserves of silver and pyrite, and the suitability of the regional resources for their glass industries. 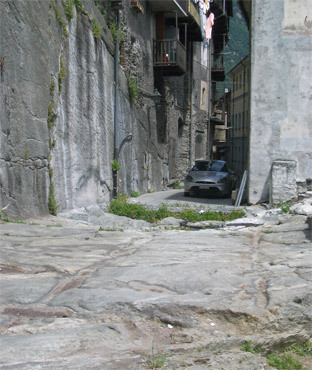 Aosta prospered under the Romans and the massive stone wall ruins still speak to their presence. And the timelessness of its pivotal location was still reflected in it being a center of regional commerce 2,000 years later. People traipsing through the region shaped its history that began before the Romans and their influence continues today. The ancient industries of glass and mining died out, but later industries like timber, the production of Fontina cheese and of raising cattle were long-time sources of income that continue, along with the more recent ones of hydroelectricity generation and tourism. Aosta served us well as a stop-over point and reminded us that it has done so for travelers to the nearby high mountains for over 2 millennia. But no doubt like many before us, we were eager to move on: soon we would be surrounded by the highest peaks in Europe that still contain over 200 glaciers. 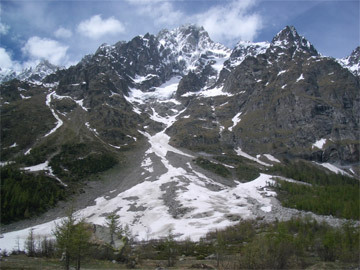 Soon we would be climbing up a few more of the even steeper 13 valleys within the Val d'Aosta. And with a little luck, we too would be traversing 1 of the historically important passes into a neighboring country. The mountain view from our hotel's breakfast room. It had been a hot, sunny day climbing the steep roads to the ski resort town of Courmayeur--the town that was to host our visit to Monte Bianco. But the warmth of the sun soon disappeared as dense, obscuring clouds rolled in. Chatting mostly in German with a tour bus of seniors from Germany delayed diving into our panniers for warm layers to put atop our sweat-soaked clothing. But their enthusiasm for our journey and questions about our equipment were irresistible and we engaged them until the last one was retrieved by the toot of the bus's horn. Lively conversations in another language are always a fun mental exercise and being the center of attention of a small group is an energizing change of pace as we spend so much time as only a two-some. Unfortunately, the delight of socializing was quickly displaced by the realities of the dismal lodging situation. Courmayeur presented us with a familiar but aggravating combination: most of the hotels were closed for a break between the winter ski season and the summer hiking season but the few that were open were charging well above their official low season prices. As before in these situations, we wondered just when those publicized low season prices kicked-in. Bill spent several hours walking around the resort town: first looking for low prices and then hoping to find a room at all. 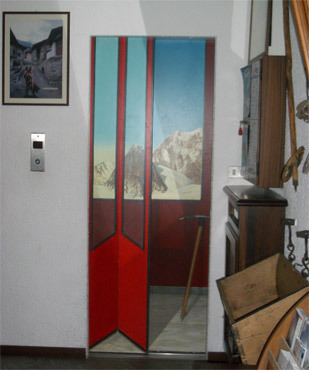 The clever painting on our hotel's little elevator door. We finally bit the bullet and paid the outrageous price for a tiny "budget" room. Without a car we had no choice but to stay in the expensive town to have the privilege of visiting Monte Bianco. We enjoyed the pleasant neighborhood view from our little room but the next morning discovered the breakfast room and the higher priced rooms had this "to die for" view towards Monte Bianco. After a bit of fuming and sputtering, we made peace with the prices and turned our attention to savoring the experience of being in the mountain town. The look of these alpine villages is always exciting, always reassuring and yet it's not obvious why they provoke that combination of reactions. Certainly the attention to detail is compelling: the neatly painted shutters lining the windows, the overflowing flower boxes, the tidy fences and well kept grounds reassure one of the orderliness of life here. And there is something very comforting about the exposed stone walls and rounds of thick stone on the roofs--these houses were built to last and look like they could weather any storm. No wind will lift that roof off, no snow storm will get the better of these houses--they exude a confidence and permanence and and even in the summer momentarily makes us want to go inside and sit by a fire. Some of the charm also comes from the haphazard placement of these immovable stone houses that seem to have grown roots deep into the ground. The villages are rarely laid out in neat grids and given buildings are rarely placed squarely on the property. Often each one is set with a different twist or turn, perhaps to capitalize on the variation in the slope of the land, to accommodate a tree that's long gone, or to meet some other, now transparent need. The odd angles give the villages the hand crafted look of an heirloom--fine work that yet reveals that it is one-of-a-kind--that it was made by hand. There is something too in the way that these houses reflect the earth from which they come and yet so clearly will protect one from the harshness that the earth and elements can dish out. The processing of the rough stone for the walls and roofs and the woods for the timbers has been slight--just enough to give them a new utility but not so much as to severe their connection with the living rock and forests. One of the stunning views on our day ride up a nearby valley. The exterior details tweak the imagination too. The broad eves remind one that part of the year these houses are framed by snow; the upper story balconies suggest a favorite view is often appreciated; and the stone chimneys with stone caps bring cozy fires to mind. And one can't miss the satisfaction that must have been felt when the curled exterior wrought iron, the sculpted wood work, and occasional geometric or floral patterns in the paint first went up on the house. These villages positively ooze with a self-satisfaction and contentment that is easily absorbed by walking the streets and lingering to admire the conspicuous details. The pride in ownership must ricochet, keeping the enthusiasm and commitment to appearances high. Of course, it is just appearances, but the ambiance that these villages create is very uplifting. Though Courmayeur had a pleasing and familiar alpine look to it, we weren't here for the village atmosphere but to get high up in the mountains and the final planning for that began in the first hour in town. We relied on tourist information's weather report to pick our day for taking the series of cable cars up Monte Bianco and checked 2 other reports over the next 36 hours. Before arriving, we had decided we'd stay as long as it took to get a clear day for the expensive venture but were lucky in that a good day was expected in 2 days, the last day we hoped to be there. We had to concede: this road was really closed. Bill had picked 2 nearby valleys which we could ride up for grand panoramas, but both roads were still under snow. One was completely closed and the other was open part way. Knowing that "closed" doesn't mean the same thing in Italy as it does in the US, we headed out expecting to ride far beyond the publicized closure point on the second road. In doing so, we remembered the grand ride up Gavia Pass on a closed road several years ago. There we had had a delightful unloaded ride (along with a number of motorcycles and other bikes) and were only deflected by snow on the road at the highest point of that pass. 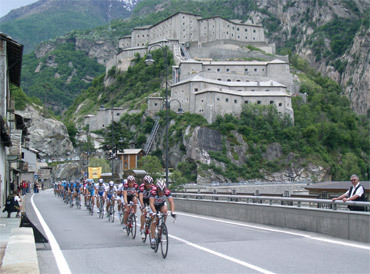 But the road closures in Val d'Aosta were different. We rode until the snow was too deep navigate and then we parked our bikes, donned our Gore-Tex socks, and walked to survey the situation. "Yup, this road was really closed." It was a puzzling combination of snow and tree debris that indicated a landslide was blocking parts of the road, though we couldn't quite figure out the sequence of events from the jumble of evidence. But we'd had a satisfying adventure to the closure point and the very steep roads had given us a good conditioning ride. The good-weather day finally arrived and a local bus from Courmayeur delivered us close to the first cable car in the series we would take to just beyond the French boarder. The rides on the Italian side were nice, but left us a little under whelmed. The view back down the valley at Courmayeur was breathtaking, but the other views from the observation platforms and cars themselves left us wondering what the buzz was. We soon found out. Looking down on Courmayeur & the valley from the cable car. It was the ride from the last Italian station of Punta Helbronner to the first French station of Aiguille du Midi that was the show stopper. For this leg, we had a comfortable 4-person gondola to ourselves rather than standing in a car for 20 people as on the Italian side. We swung across what seemed like a high valley but we were actually traversing 3 miles of glaciers, which were spectacular. 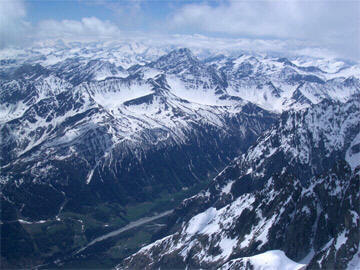 We could look down and out across snow laden glaciers that were cracking as they ground down the slopes. The enormous scale of it all was underscored by the few hearty skiers that hiked into some of these bowls and were mere wiggling dots from our suspended vantage point. Initially, the long stops the cars made were disturbing as flashes of disaster movies came to mind, but a note near the ceiling of the car reassured us that these were normal. The 4 person cars traveled in packs of 3's and there were a number of clusters attached to the cable. Whenever a cluster reached a station, the entire cable would slow or stop for loading or unloading. The journey to the highest cable car station. 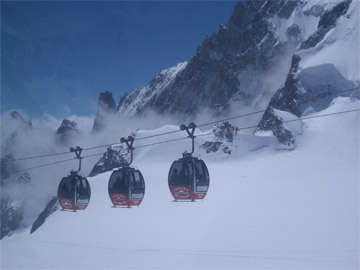 The cable car station at Aigulle du Midi was not just a stop, but an event. There is an elevator in or along side one of the massive needle-like spires that delivers you to the 3842m or 12,600' level with a nice observation platform. There are a confusing number of ice and rock tunnels, stairs, and platforms to explore, all which pleasantly extend the expensive journey. This station provided the excitement we had longed for on the Italian side. But of course it was the phenomenal perch that this French station was built on which gave it a stunning setting. We scampered around on all the options for views and photos and were delighted to find a bench cut in the rock that was barely out of the wind to enjoy our picnic lunch. It wasn't easy to elude the wind outdoors and most of the indoor spaces were bone chilling without the warmth from the direct rays of the sun. The actual peak of Monte Bianco at 4810m, almost 16,000', wasn't so dramatic from the observation platform but the entire cluster of needles and peaks were worth the price of the tickets. 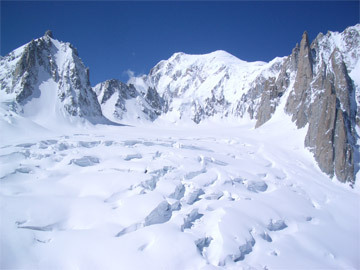 A cracking glacier field with ski tracks on the upper right. As we picnicked, a passing American woman commented to her companion "I'm up over 12,000', there isn't a pine tree anywhere to be seen, how can I be having allergies?" And she wasn't the only one we heard making a similar comment. It was a small consolation for our allergy miseries to know that we weren't alone and that they weren't easy to escape. I guess if mercury from coal burning in China can make it to the US, the pollen can waft up another 10,000'. On our return trip from Aiguille du Midi, our car stopped a couple of extra times and for more than the 1-2 minutes they were suppose to be stopped, but we loved it. The sun heated our little plastic-walled bubble and we could at last be both warm and take in the stunning views. A small window opened on 1 side of the cars for ventilation and aided in snapping clearer photos. 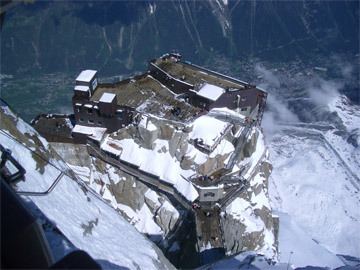 Looking down on Aiguille du Midi & Chamonix below it. It hadn't been an absolutely cloudless day but grand enough to deliver the stunning panoramas we had hoped to see. We had lingered long enough at each of the observation areas that the changed position of the sun highlighted different features on our return trip. Soon the series of cable cars would take us from the chilling winds of the highest place we'd ever been back down to the early summer heat in Courmayeur. 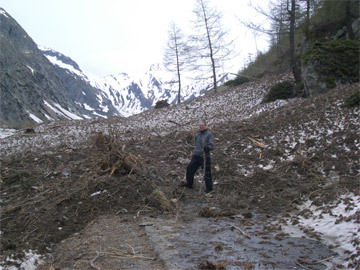 And the next day we would further rewind our trip by retracing our path down the Val D'Aosta, unable to proceed because the bike-friendly passes at the north end of the valley were still closed by late snows. Should you be tempted to visit Monte Bianco (Monte Blanc) yourself, check out our "Northern Italy" file under "Country Details" for what we learned about having a successful adventure. A skier heads out from Aiguille du Midi. On July 23 we finally said good-bye to Italy after months of cycling in the more northern reaches of the country. Guess we had to make up for 2004 when we didn't visit Italy at all. We are currently in an itty bitty mountain village 100 miles south of Salzburg, Austria and will spend about a week in the country. Bill has his sights set on Berchtesgaden, Hitler's hideout in southern Germany. From there, we will continue north through central and western Germany. Our plans to visit Australia and New Zealand are still alive and we expect to return to Portland for a brief visit in the fall and then enjoy a longer stay at the end of the winter. We learned the hard way last year that we need to swing through North America to capitalize on the higher baggage limits we need for transporting our bikes to the southern hemisphere.